Our organization is manufacturing, exporting and supplying Silk Cashmere Stoles to our clients in Amritsar, Punjab, India. Silk Cashmere Stoles having soft pink, green, red,orange colors are absolutely suitable for daytime or casual wears.Buy Wholesale scarves in bulk quantity at discounted prices as ENGLISH CREATIONS CRAZE is a wholesaler From India, manufacturer, supplier, exporter of scarves, shawls, stoles, Pareos , Kaftans, Sarongs, bags, ponchos, Kimonos, jacquard scarves, printed scarves, fabrics. English Creations Craze is one of the big names in India in exporting, supplying of Silk Cashmere Stole in Amritsar, Punjab, India. These printed Silk Cashmere Stole are available in a multitude of colors and match with formals & casuals.Importers buy Wholesale scarves in bulk quantity at Competitive prices as ENGLISH CREATIONS CRAZE is an exporter From India, wholesaler, manufacturer, supplier of scarves , shawls , stoles , bags , ponchos , jacquard scarves , printed scarves, Pareos, Kaftans, Sarongs, Kimono , in all kind of fabrics From India. We manufacture, export and supply an outstanding collection of Silk Cashmere Jacquard Stoles in Amritsar, Punjab, India. These Silk Cashmere Jacquard Stoles are widely appreciated by our clients as we are prominent exporter, manufacturer & supplier of it from Amritsar, Punjab, India.Clients can buy Wholesale scarves in bulk quantity at Competitive prices as ENGLISH CREATIONS CRAZE is a manufacturer From India, wholesaler, supplier, exporters of scarves, shawls, stoles, bags, ponchos, Kaftans, Sarongs, Kimono , printed scarves, jacquard scarves, Pareos and fabrics. We are occupied in manufacturing, exporting and supplying Fashionable Silk Cashmere Printed Stoles in Amritsar, Punjab, India. These Silk Cashmere Printed Stoles are Available In An Exotic Blend Of Eloquent Pattern, Vibrant Colors.Customers can buy Wholesale scarves in bulk quantity at discounted prices as ENGLISH CREATIONS CRAZE is a supplier From India, wholesaler, manufacturer , exporter of scarves, shawls, stoles, bags, ponchos, Pareos, Kimonos, jacquard scarves, printed scarves, Kaftans, Sarongs, and Fabrics. We manufacture, export and supply Silk Cashmere Blended Stoles in Amritsar, Punjab, India. A Silk Cashmere Blended Stoles is a versatile accompaniment to any outfit.Clothing stores can buy Wholesale scarves in bulk quantity at discounted prices as ENGLISH CREATIONS CRAZE is a supplier, wholesaler, manufacturer , exporter of scarves, shawls, stoles, bags, ponchos, Pareos, Kimonos, jacquard scarves, printed scarves, Kaftans, Sarongs, and Fabrics From India. 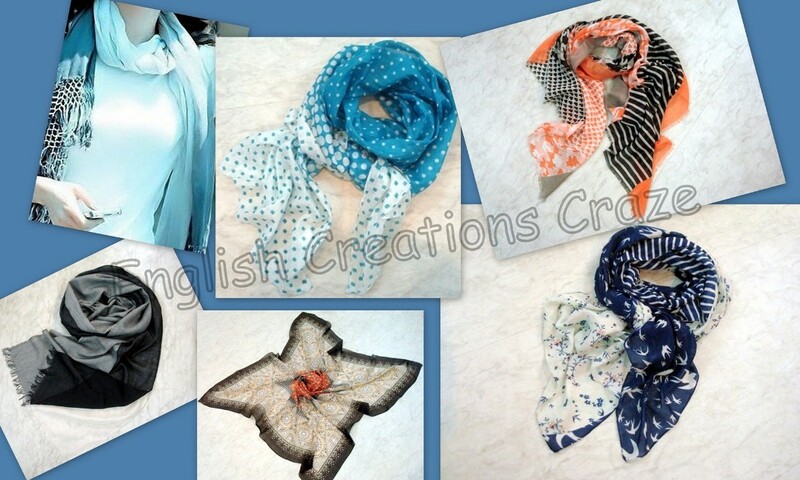 English Creations Craze is one of the big names in India in manufacturing, exporting and supplying Silk Cashmere Printed Stoles in Amritsar, Punjab, India. Our Silk Cashmere Printed Stoles are manufactured in ethnic designs, patterns, textures and colors.Brands can buy Wholesale scarves in bulk quantity at discounted prices as ENGLISH CREATIONS CRAZE is a supplier, wholesaler, manufacturer , exporter of scarves, shawls, stoles, bags, ponchos, Pareos, Kimonos, jacquard scarves, printed scarves, Kaftans, Sarongs, and Fabrics From India.